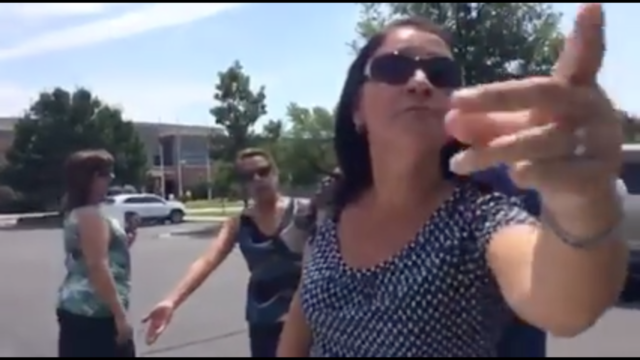 GRAND JUNCTION, Colo. – A Mesa County, Colo. woman whose racist rant against a local Latino mom was videotaped and posted on Facebook, says she regrets her words. The family of the woman she targeted says her contrition doesn’t sound sincere. The confrontation occurred earlier this week outside the Mesa County Health Department. That’s where Yolanda Flores Chavez had taken her son to get a physical, so he could play football. They left their dog in the car. Laura Bennett walked by, saw the dog and confronted Yolanda’s son and 6-year old granddaughter when they came out of the clinic. She told them “police were going to take their dog away,” said Wendy Flores, Yolanda’s daughter. The fireworks began in earnest when Yolanda came back out. Ms. Flores Chavez says Bennett yelled at her about the dog, then began calling her names. Yolanda, who has lived in this country legally for 23 years and who speaks broken English, got flustered and began to reply in Spanish. “As soon as I saw the video…my heart started racing and my blood just boiled because I couldn’t believe that stuff was being said to my mom,” said Haily Flores, Yolanda’s other daughter. Bennett told ABC affiliate KJCT in Grand Junction that she used “inappropriate” words out of anger and frustration. KJCT says Bennett told them she lost her job over the incident. “Tempers were hot on both sides,” she said. “She wouldn’t even admit to being racist,” Flores said. Denver7 reached out to the Colorado Immigrant Rights Coalition and asked for reaction to the video. Sherman Perez says the rant points to a certain ignorance that still exists about people of color. “The assumption, based on the (victim’s) language and skin color, were that she was using public benefits,” Sherman Perez said. She added that posting the video online is a great way to start the conversation about racism and fear. Click to see the video below. Warning: Video contains language that some might find derogatory or offensive.